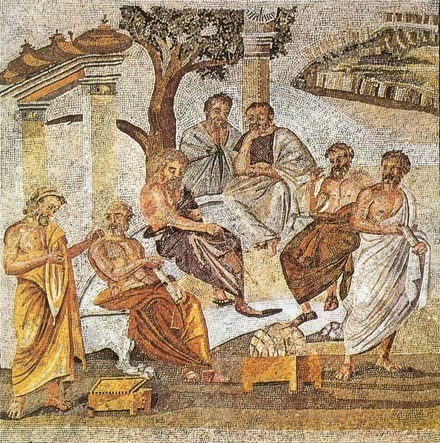 Beginning with the earliest ancient thinkers, the series will look at the ideas and lives of the major philosophers (eventually covering in detail such giants as Plato, Aristotle, Avicenna, Aquinas, Descartes, and Kant) as well as the lesser-known figures of the tradition. That's what Adamson promises, and he doesn't disappoint. Over the past 34 months, Adamson has produced 136 episodes, each about 20 minutes long, covering the PreSocratics (Pythagoras, Zeno, Parmenides, etc) and then Socrates, Plato and Aristotle. That's roughly 45 hours of audio, and there's no telling how many more hours of audio will bring us to the modern period. The more, the better, we say. You can access all episodes via these links: iTunes - RSS Feed - Web Site. Or find other free philosophy courses in our big collection of Free Courses Online. I’ve been listening to this podcast from the beginning. The content, production, pacing, and spacing are exemplary. I only hope that I live long enough to enjoy all the episodes (I’m currently 53). …or that Professor Adamson lives long enough to complete his mammoth project! These are great podcasts. I have listened to several available from iTunes, and these rank as the most clear and effective. Very interesting information. Though the title (original) could have been better. “The History of Western Philosophy” is apparently more honest compared to the rather misleading and narrow choice made here. I believe he will be at least doing middle eastern philosophy, having written books specifically on the topic. I know he is planning on going all the way to Kant but I can’t find mention of whether he will move past that. Hope he’ll do a segment on women philosophers!! Thanks for these offerings & keep them coming. This world is sorely in need of more wisdom. Now 2015, Professor Adamson has moved into and through Islamic philosophy (his specialized area) as well as some medieval Jewish and several on medieval women philosophers, and has now begun a branch into Indian philosphy. This is an amazing, brisk, well done series. I have listed to peters audios on history of philosophy in eastern ,i really interested in now i hope this to be the same.But with respect peter pay attention to indiveduals rather than philosophical thoughts throughout his depicted history.